Guess which Browns coach has the best record in the month of November since Marty Schottenheimer was looking for a gleam along the lakefront? 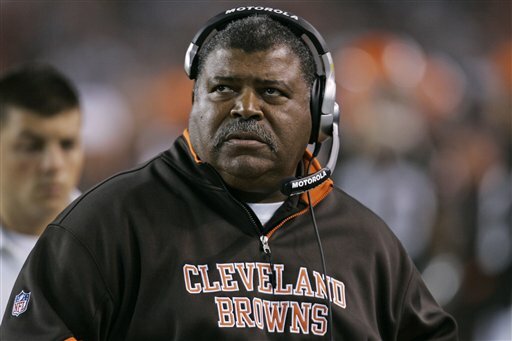 That’s right, old friend Romeo Crennel. According to a story in the Canton Repository, Schottenheimer was 14-8 in November as Browns coach, since then things have been not so friendly to Browns coaches. Crennel tops the list at 7-10, followed by Bill Belichick (6-15), Butch Davis (5-10), Bud Carson (2-4-1), Chris Palmer (2-6) and Eric Mangini (2-6). Current coach Pat Shurmur has a chance starting Sunday in Houston to make his own mark. After the game with the Texans (5-3), the Browns have home games with St. Louis (1-6) and Jacksonville (2-6) and an away tilt with Cincinnati (5-2). Speaking of the Browns and their upcoming opponents, Grantland did a mid-season report on the AFC and had some interesting items about the teams that Cleveland will be facing in the upcoming weeks. The Baltimore Ravens have 25 sacks through seven games, the second-highest total in football. Last year, the Ravens had 27 sacks all season. Ben Rothlisberger just soiled himself. The Cincinnati Bengals haven’t lost a fumble on offense all season and have managed to grab 13 of the 18 fumbles in their games this year. The fumble luck and short fields have helped Cincinnati’s limited offense to the best average starting field position in football. That’s not going to continue and it will be fun to watch the Bengals crash back to earth in the second half of the season. Eight games into the season and Pittsburgh’s defense has just two interceptions and one fumble recovery. The Steelers three takeaways are the fewest for any team in NFL history after eight games. After they play the Ravens this week, Pittsburgh’s schedule turns pillow soft, with four games against the Bengals and Browns, two games against the NFC West and a game against the Chiefs. Since 2000, teams have thrown for fewer than 100 yards in a game 363 times; Jacksonville’s Blaine Gabbert has failed to throw for 100 yards in three consecutive games. That has happened only four times since 2000; can you guess the most recent? Yep, Derek Anderson and Brady Quinn pulled off that feat of offensive ineptitude in 2009. With No. 1 LSU and No. 2 Alabama ready for a showdown on Saturday, Chris Dufresne at The Los Angeles Times points out that the loser shouldn’t get a rematch in the BCS title game. If the loser gets another shot and they win the rematch, why should that game carry more weight than Saturday’s tilt? Plus, as much as we love watching SEC football, there are other conferences out there. You can’t shutout other legitimate contenders and deny them a chance at Saturday’s winner (presuming they win out the rest of the year). Thankfully, that potential list of other contenders won’t include anyone from the Big Ten.